As a parent I am constantly reminded and aware of the various milestones that Elise should be reaching. Some she reaches early, some right on time and other she is yet to reach. It's always so exciting when she reaches a milestone, such as getting her first tooth, saying mummy for the first time and her latest one of being able to stand. However, sometimes the milestones aren't all nice...we've all witnessed the first poo explosion, and the sleepless nights. That's why ACE have created these honest baby cards. They celebrate, and laugh at, those times that aren't so sweet, and sometimes are messy and just a little bit disgusting. With their stain remover for colours and whites, you don't have to worry about your little one getting as messy as they like. 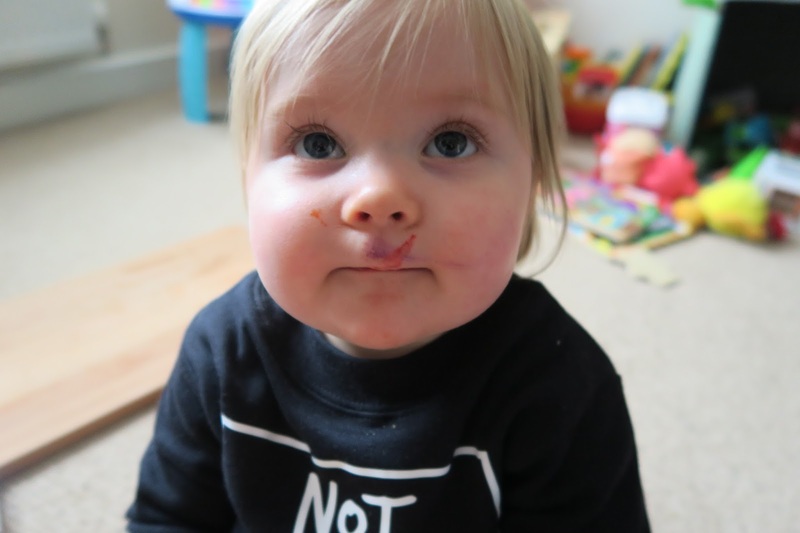 Elise has very sensitive skin and because of her eczema I have to be very careful with the products I use on her skin. 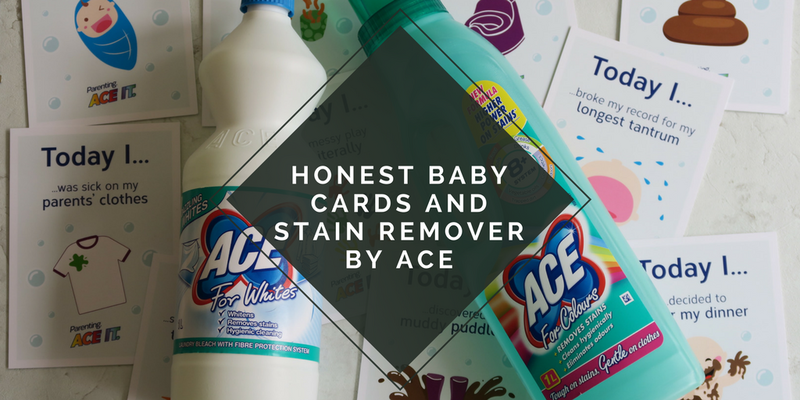 At first I was a bit worried about trying out the ACE Stain remover products, as I was worried that her skin might react to it, but I didn't need to worry. We actually use unscented products to wash Elise's clothes, and we wash them separate to our own so we know nothing nasty is going to get on her clothes. We find that in the past anything that is scented has made her skin react, she just is very sensitive to everything, she even has to bath with no products. That's why on the first instance I used the stain remover in with our clothes first. I have also tested out the stain remover for whites on our bedding and found that it did make them whiter and crisper. I'm always looking to improves whites as there is nothing worse than faded or stained whites. Nobody wants a grey shirt when it should be white! I'm often disappointed by whitening products, but I am impressed with this one by Ace. I found that it very easy to use, and it just became part of my washing process. 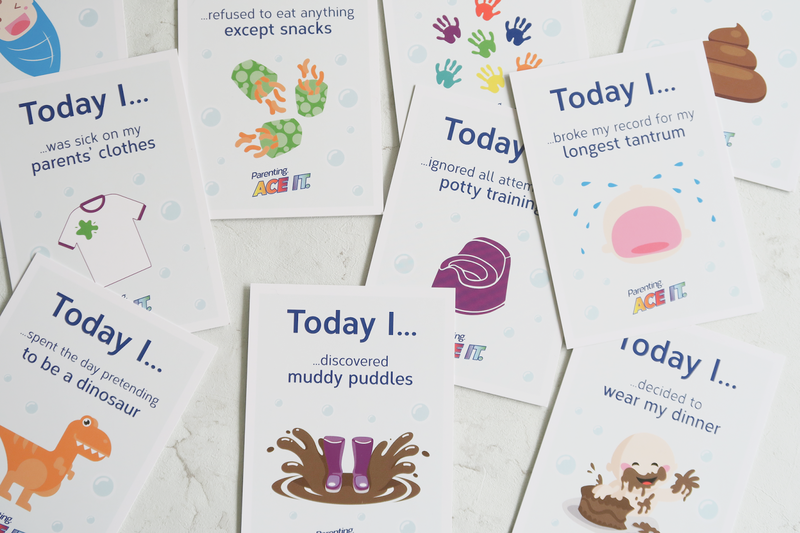 ACE have created some honest baby cards for parents to share in the humour of every day life when raising little ones. I particularly like the one that says "Today I spent the day pretending to be a dinosaur" as Elise loves dinosaurs at the moment. She is constantly roaring just like her favourite dinosaur characters and can be found carrying round her favourite dinosaur toy. We are also pros when it comes to getting a bit messy when doing some arts and crafts, so the messy play one definitely applies to us. We haven't done any jumping in muddy puddles yet as Elise cannot walk, but we are looking forwards to this. I think we are also lucky that she has never been a baby who throws up often, so we have avoided this card. We've also only had a few messy nappy situations, but I'm expecting some accidents when we start potty training. IF YOU LOVED THIS POST, PLEASE SHARE IT! The ACE products mentioned in this post were sent to me for my consideration. You can read my disclosure policy here. I would like an honest card that says 'today watched kids TV without the kids'! I ate all the kids' easter eggs! Today i wee'd on daddy! I would like to see today i sat on the naughty step for the first time. Today I had a tantrum in the middle of a busy shop! Today I stood in my dirty nappy and got it all over the rug. Today I pooed on the floor. I ran around the house naked, refusing to get dressed. Today I said "It's messy" when I was at nanny's house. I would love to see Today my grandparents spoiled me! Today I had my first haircut! Today I played on the Xbox for less than 6 hours! Today I had a meltdown! Today I tried to pour myself a drink and made a BIG mess. Today I tried to eat my own poop! Today I made my Mummy cry! Today I waited until my nappy was clean before I pooped! Awesome blog that you shared article in your blog it gives helpful information, Thanks for sharing. If you are in need of some immediate cash with bad credit, No credit check loans are one of the easy and felicitous borrowing options for you.